Your search for the perfect product tag ends here! 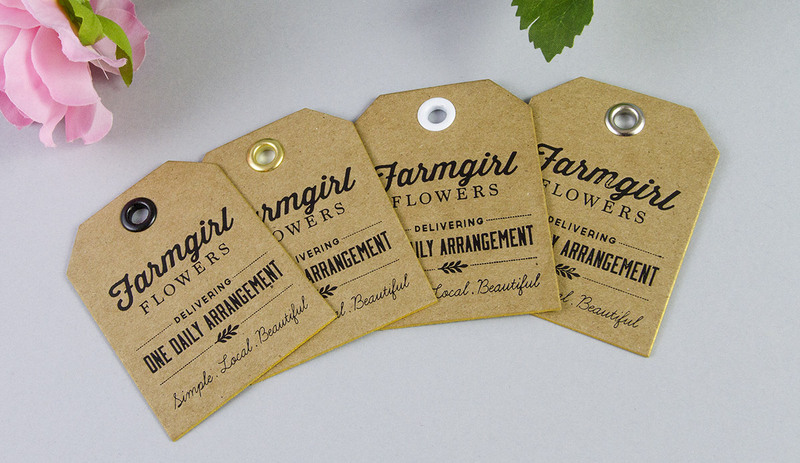 Discover our impressive collection of Hang Tags - created to make your brand stand out. We know that ideal tags are both eye-catching and functional. We strive to offer the highest quality printing on the most unique paper stocks, in a wide range of shapes and sizes to suit every product both large and small. Choose your desired hole drill size depending on your needs. Browse through our add-ons including hole drilling, strings, metal grommets and colored reinforcement rings to finalize your order with everything you need for the perfect Hang Tags. Available in Gold, Silver, Antique Brass and Matte Black, our Metal Grommet is that metal hardware on your hang tags that adds a subtle touch of class, but won't break the bank. Add these to your hang tags directly from the Add-ons box below! As hang tags are a reflection of your brand, choose our 90pt Boardstock Hang Tags to exude quality and luxury. These are extra thick and rigid, and will sure make a notable impact with your customers. Available in standard or custom shape, and with add-ons such as our metal grommets! Available Hole Sizes: .125", .25"
Luggage Tag (Rounded Ends) - 0.925" x 2"
Yes, absolutely! All hang tag orders with the addition of strings will be attached for you. You will receive your hang tags with the strings attached so you can easily tag your product straight out of the box. 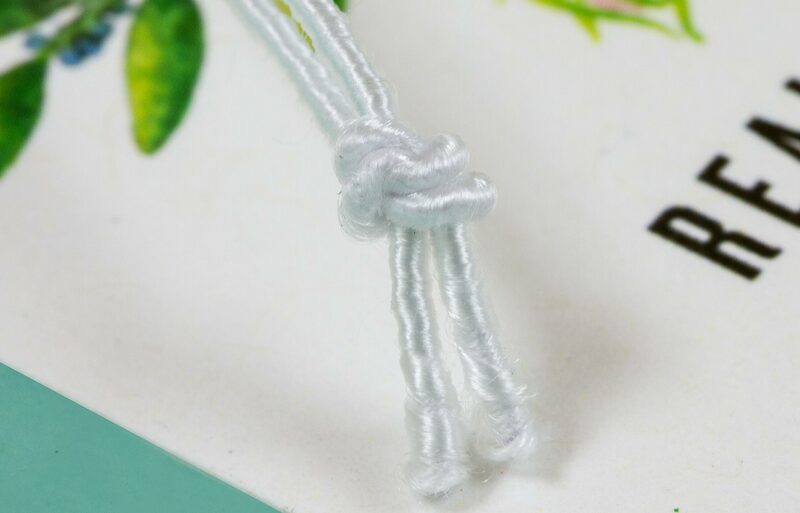 The strings will have tying ends, just like the photo below. 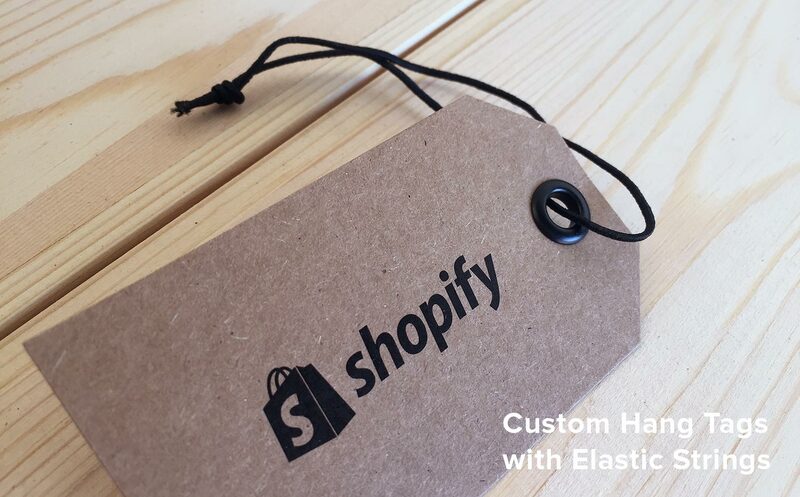 For a clean and sleek look, step up your hang tags with the addition of elastic strings! You can easily add this string option directly from the Add-ons section of our Hang Tags page. 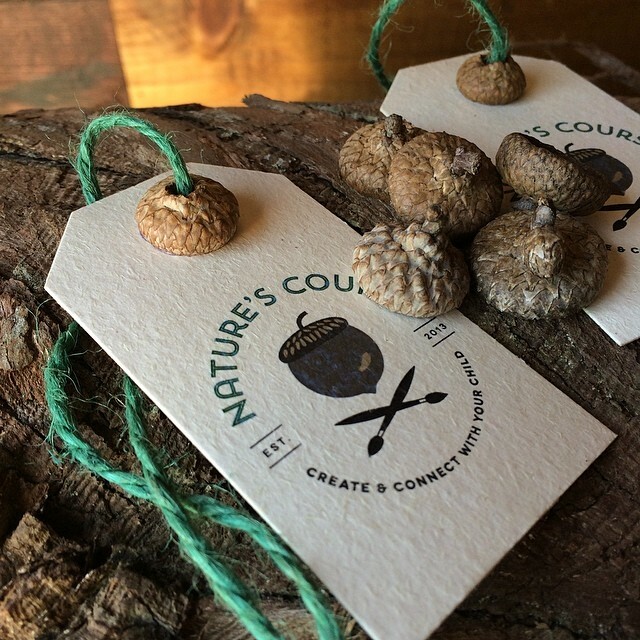 If you would like to view these samples in person, you can request the Hang Tag Collection as part of a specialty sample pack order. 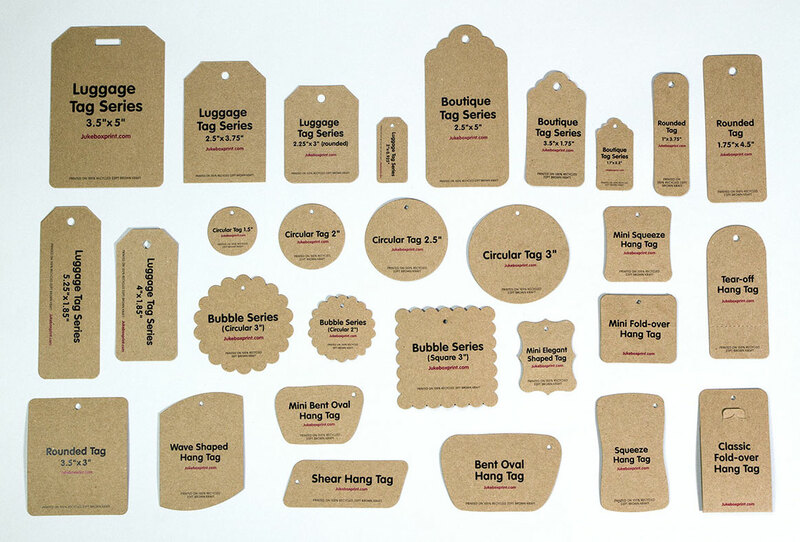 We have a great variety of hang tag shapes, many with different size options to suit all types of products. 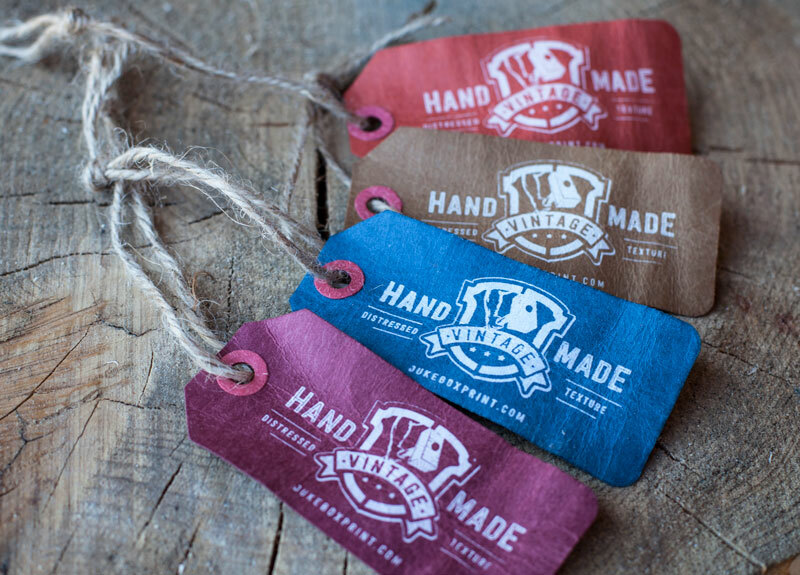 View our complete Hang Tag Collection below, featured in 18pt Brown Kraft stock. Samples of our Hang Tag shapes and options are available by ordering a Specialty Sample Pack. The smallest details make the finest finishes. Dress up your tags by adding Metal Grommets or Reinforcement Rings, conveniently from the Add-ons section of our Hang Tags page! request here and a member of our Print Estimations team will provide you with a quote. Please ensure to provide all prints specifications and to supply your print-ready or mockup file so we can accurately provide a price and further guidance. What size hole should I order for tagging guns? Our smallest hole size of 0.125 inches might be too large for some tagging-guns. We recommend testing the hole size before ordering your hang tags. If you require a smaller hole size, please order via a Print Quote request. The smaller the hole the better for tagging-guns. What add-ons are the Hang Tags suitable for? Please submit a Print Quote request if the option you are looking for is not available for order on our website. Can I order Brown Kraft Hang Tags? Can I order riveted Hang Tags? Yes, we are able to produce riveted-hole (eyelets) hang tags. Please submit a Print Quote request for this service. 0.125" hole is the most popular hole size. We have a range of different Hang Tag hole sizes available. The size of the hole depends on the usage of the Hang Tag. What hole sizes are available? Most of our products can have hole drilling added, and larger holes are available via a custom shape (additional costs may apply). We can create Hang Tag holes at any size. Hole sizes available for each Hang Tag are selected during the order process. If you require a custom hole size (or one that is not available when ordering) please place a Print Quote request. Can I move the hole position on my Hang Tag? Yes! The hole size and placement can be adjusted on any of our Hang Tag shapes. Ensure that the uploaded files define the correct hole size and placement. This item was produced by our Development Team. It was designed as inspiration for how our products can be used. The above photo shows a 3.5x2 Luggage Shape hang tag printed on 20pt Cream Pulp stock. The acorn add-on is not available to order. We offer full color printing and white ink via screen print (for an additional cost) on our colored Kraft stocks listed below. A variety of pre-made Hang Tags or Shaped business cards are also available. 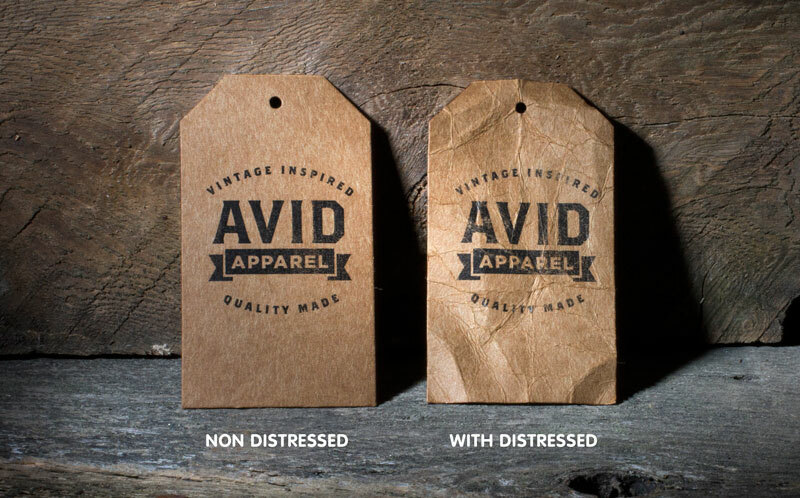 Explore our Hang Tag page for pricing and ordering Distressed Hang tags! Distressed Texture is also available to upgrade business cards and flyers as large at 4" x 6". Keep in mind that this process can wear away some of the print and may result in reduction in visibility of small print and fine detail. If you're interested in this product, please Request a Quote for pricing and order. 4" x 1.85" Luggage Hang Tag screen printed with white ink on 18pt Coloured Kraft (Burgundy, Navy Blue, Dark Brown and Burnt Orange) and finished off with red paper rings, twine and distressed texture. Distressed Texture, a rare and exclusive texture to Jukebox, is one of our most popular add-ons as it instantly transforms your product from ordinary to wow! It is a special feature used to upgrade the appearance of hang tags - each piece is hand-made, giving your hang tags a vintage look. No hang tag will look the same!